He clarified that he visited Goa in March at the invitation of the Catholic Council of Goa. Jesuit priest and human rights activist Cedric Prakash has termed as “extremely mischievous” the allegations leveled against him by BJP leader Manohar Parrikar. At a press conference two days ago Goa Chief Minister Parrikar accused the priest of trying to spread religious and social discontent based on “falsehoods” in Goa before the general election. Parrikar said the Ahmadabad-based priest toured Goa with the support of the Catholic Church, accused BJP leader Narendra Modi of religious intolerance and attacked the Gujarat model of governance. Parrikar also compared the Jesuit with fanatic Sri Rama Sene chief Pramod Muthalik. The allegations “extremely mischievous and very unfortunate,” Prakash said in a statement yesterday and clarified that he visited Goa in March at the invitation of the Catholic Council of Goa. He said on April 9 he has already sent a response to Parrikar on “some of his earlier allegations. “There is nothing which I have said which is not true or which cannot be substantiated with concrete data,” the priest’s statement said. Prakash said he always advocated communal harmony and peace “but I do so within the framework of justice and human rights for all. I have never attacked or said anything against another’s religious beliefs,” he said. The focus of “all my talks was (and which will continue to be) the Constitution of India, the values enshrined in them and the fact that large sections of our people are deprived of their legitimate rights both in Gujarat and in other parts of India, the statement said. It said the constitution gives him “the right of freedom of speech” and that the Freedom of Religion Law enacted by the Government of Gujarat in 2003 goes against constitution that guarantees “every single citizen the right to freely profess, practice and propagate one’s religion.” It also violates the Universal Declaration of Human Rights, which gives one the right to freely change his religion or belief to another, he said. “I have never used or abused any religion to create any ‘discontent’. My closest associates and friends belong to all religions and particularly from the majority community,” the statement said. The allegations are “a blatant attempt to intimidate human rights defenders like Father Prakash,” said the campaign letter began by right activists Hiren Gandhi of DARSHAN and Saroop Dhruv of INSAF. Prakash is “a long-standing campaigner for human rights, justice and peace-and he has been consistently taking up the cause of those whose human rights have been violated -irrespective of their religious background,” it said. He said action should have been taken against Fr. Cedric Prakash. Goa Chief Minister Manohar Parrikar Wednesday accused Gujarat-based Catholic priest and human rights activist Father Cedric Prakash of trying to spread religious and social discontent based on “falsehoods” in Goa before the general election. Equating the priest with controversial Sri Rama Sene chief Pramod Muthalik, Parrikar, justifying police action against Facebooker Devu Chodankar following his anti-Narendra Modi posts, said action should have been taken against Prakash too. “Father Cedric Prakash has said much more serious things which were not true,” Parrikar said, while addressing a press conference here. Ahmedabad-based Prakash, a Jesuit priest, made a whirlwind tour of Goa with the support of the Roman Catholic Church in Goa, during which he accused Modi of religious intolerance and attacked the Gujarat model of governance. He further alleged that in Gujarat every one lived in fear. “The voice of the media has been throttled and muzzled. People in Gujarat are living in fear. IAS officers are living in fear. The lives of their families have been ruined,” Prakash claimed at a meeting at the Grace Church hall in Margao, in south Goa March 20, a few weeks before Goa went to polls. Parrikar also said that he despised those who “used religion for politics” and clubbed both Prakash, as well as Muthalik, head of the notorious right-wing Sri Rama Sene, in the same bracket. Muthalik has often triggered controversy in the past by attacking patrons of pubs in Mangalore for adopting “Western culture”, and exhorting Hindus to arm themselves with swords. “I count Father Cedric and Pramod Muthalik as the same. People who use religion as a tool for electioneering are dangerous,” said Parrikar, whose government is being accused by the opposition as well as civil society of carrying out a witch hunt against Chodankar. In Goa, where the Catholics account for nearly one-third of the population, Prakash’s whirlwind pre-election lecture tour and a circular by the Church imploring voters to cast ballots in favour of a secular candidate did dent the BJP vote tally, even though the party managed to win both the seats from the state in the Lok Sabha election. He said that Modi could prove divisive, “side-lining” minority groups and stoking discrimination and prejudice. Archbishop John Barwa of Cuttack-Bhubaneswar has said that the new Indian government could spell disaster for minority groups if it did not remain true to its promise to govern for all. Archbishop Barwa said he hoped new Prime Minister Narendra Modi would stick to his promise to govern for every community, irrespective of caste or creed, tackling widespread corruption and providing good governance. But he also spoke of grave fears that Modi, whose BJP party is described as a Hindu nationalist, could prove divisive, “side-lining” minority groups and stoking discrimination and prejudice. The archbishop, who was interviewed by Catholic charity Aid to the Church in Need, spoke against a backdrop persecution in his diocese, which in successive waves in 2007 and 2008, killed over 100 people and prompted up to 50,000 to flee their homes after a spate of attacks on Christian communities. “I am worried of – let us say – a side-lining of minorities because in our past experiences we have – not only in Odisha but elsewhere – gone through suffering, struggle and persecution,” he added. The prelate, during the interview, spoke of fears of an increase in discrimination against minorities amid concerns that the new government may be ambivalent in its response to oppression against Christians and other minorities. But the archbishop highlighted Modi’s election pledge to govern for all – including smaller faith groups and less influential ethnic groups. “Everybody was attracted by [Modi’s] slogan that there will be developmental activity, developmental progress whether they are Dalits, or they are Tribals or they are Hindus or they are Christians.” He said he “hoped and believed” this inclusive agenda would be “translated into reality”. Highlighting the need to work for better inter-faith relations, he said that media work was crucial to breaking down barriers with other religious groups and described initiatives aimed at including non-Christians in major Church celebrations. Over 40 people and 15 policemen were injured in the commotion. 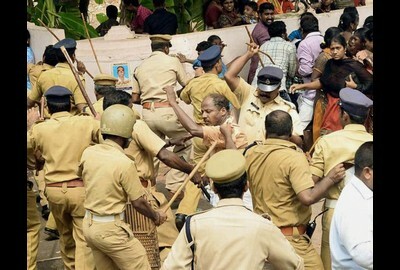 The police fired teargas shells and used batons to disperse a group of Catholics who tried to break the police cordon and enter the Bishop’s House in the diocese of Quilon in Kerala on Sunday. Over 40 people and 15 policemen, including Assistant Commissioner K. Lalji were injured in the commotion. Police arrested some 50 people and injured were admitted to the District Hospital in Kollam. Some 500 people of Saint Joseph parish in Kureepuzha, including women and children, carrying black flags, marched to the Bishop’s House protesting Bishop Stanley Roman transferring their vicar Joseph Daniel. The police said they resorted to the use of ‘mild force’ as the protestors tried to violently gatecrash into the Bishop’s House. They also threw stones, the police said. The police fired four rounds of teargas shells. The parishioners said the police action was unprovoked. The parishioners say the vicar should not be transferred till the construction of their new parish church was over. In November, following protests parishioners were assured that the vicar would not be transferred. The fresh transfer order, they say, violates that agreement. The order was read out at the Sunday mass. Subsequently, the parishioners decided to take out a march to the Bishop’s House. The police cordoned off the area anticipating tension. The parishioners made several attempts to breach the cordon and rush into the campus. The police resisted without using force. Then, the protesters squatted on the road and raised slogans against the Bishop and the transfer order. As there was no initiative on part of the Bishop to initiate talks, even after 45 minutes of protest, the parishioners started venting their ire on the police. Mr. Lalji got in touch with the Bishop’s House authorities and urged them to hold talks. Diocesan spokesperson George Rebeiro said transferring vicars and priests under the Catholic Church was the prerogative of the Bishop and Daniel was transferred as part of a general transfer procedure. Daniel himself had explained it to the parishioners but they were not prepared to listen. He said it was unfortunate that a group of parishioners resorted to violence after misreading a routine diocesan procedure. It is a well known fact that Parish authorities use divide and Rule Policy to keep parishioners busy fighting among themselves. PPC Meetings are sometimes stormy on some issue or the other. Office bearers of PPC are always on the side of Parish authorities, in case some other members question or points out to the irregularities Committed by Parish Authorities or Parish Priest. These members then go into the bad books of parish Priests. Parish Priests do not like their decisions to be questioned by anyone. This has happened in case of St. Joseph Church, Miraroad, and Our Lady of Good Counsel, Sion. These matters have been brought to the notice of our readers earlier. 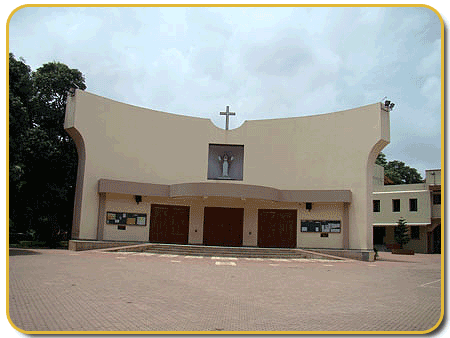 This post is related to Sacred Heart Church, Andheri (E). Matter has been referred to H. E. Cardinal Oswald Gracias. However, there is no response from his office yet. attached letter shall explain the matter in detail. Hope this letter finds you in pink of health and we pray to our LORD JESUS CHRIST that he bestows upon you his choicest blessing to carry out his mission which has been assigned to you by HOLY FATHER Pope Francis. This is our first letter since your appointment by Pope Francis on GROUP OF EIGHT TO ADVISE ON CURIA REFORMS. Unfortunately it is, as usual, about some undue happing at one of the parish within Archdiocese of Bombay. This time it is at SACRED HEART CHURCH, ANDHERI (E). Attached please find some E mails between Parish Authorities and a couple of Parishioners, which shall give you an idea as to how the parish is being run. Before we proceed, we wish to state that this problem could have been resolved by the parish Priest by offering a GOOD LISTENING EAR to the aggrieved Parishioners. Instead, he chose to aggravate it further, by getting other parishioners involved. One Mr. Michael Rodriguez, VP – PPC has been sending E Mails, SMS’s and making phone Calls to a Parishioner, Mr. Baptist Fernando who is also a PPC member and an active animator of a SCC zone, to attend an emergency meeting. Reason to call for this EMERGENCY Meeting????? Another animator from the group has given a letter to Parish Priest, Fr. Baptist Pais against Mr. Baptist Fernando, who has forwarded the same to Mr. Michael Rodrigues, VP – PPP, We suppose for some kind of action. Was it right on the part of Parish Priest to make an issue out of this? Is it right on the Part of Mr. Michael Rodrigues, VP – PPC, to call for Emergency PPC meeting to discuss this issue? Wouldn’t it be appropriate to handover the copy of the letter along with agenda to Mr. Baptist Fernando, to understand the letter/Issue and prepare his defense, if necessary? Appropriately, Mr. Baptist Fernando decline to take a call to attend this illegitimate meeting. Another reason for Mr. Fernando’s refusal to attend the meeting is, similar meeting was called by VP – PPC earlier and during the meeting he was humiliated by all and sundry, giving him no opportunity to explain his views. Is this how PPC meetings are conducted? As per our understanding of PPC and its full form is PARISH PASTORAL COUNCIL; which means it is meant to assist the Clergy in Pastoral matters of the Parish. Does above matter falls into Pastoral Category? You take a call on this your Eminence. Minutes of this meeting are not yet handed over to the participants. The Participants, including Ms. Anita D’sa, are insisting on the minutes as, according to them, would help bring out the truth. All said and done your eminence, is this way to run a Parish? Anyone could write a letter against some parishioners and the entire PPC gets busy with finding the so called truth… Don’t the PPC members have something better to do? Don’t you think that Fr Baptist Pais, Parish Priest; could have just cosigned the letters to dustbin or called both the parties and settled the matter, amicably, once and for all? Besides, It is hard to believe that youth would dare to write against any parishioner. It is needless to say that some persons having vested interest have used the youth, to shoot from their shoulder… Now that the matter has reached to the extent of no return, the culprit needs to be exposed. Your Eminence, apart from these two, Baptist Fernando and Anita D’sa; we have in our possession a list of parishioners who are being marginalized by Parish authorities or so to say by some members of PPC. These Parishioners have been active in the Parish for around three decades each. Now all of a sudden they are being eased out unceremoniously. One of them is Conrad D’sa who has been conducting a choir for around several years and which was declared as the best Choir in the Archdiocese of Bombay. Apart from conducting Choir, he was involved in many activities and one among them is putting up quotes on the display board facing the road. He was asked to discontinue doing the same and the charge was handed over to someone else. Of course, it is the Parish Priest’s prerogative to decide on who should or should not do certain jobs in the Church, which we do not deny. However, being the Shepherd of the flock, what could have been a better way than politely conveying the same to him, orally? But he chose to do so through E Mail, which we find amusing. While talking about E Mails, we have in our possession a folder, full of E mails, between Parishioners and Church authorities including Parish Priest Fr, Baptist Pais, which would make an interesting reading and give an insight into how a Shepherd who is supposed to care for his flock in unbiased manner, behaves. Your Eminence, We do not blame the Parish Priest alone for this state of affairs because he seems to have been influenced by some office bearers of PPC, who certainly must have vested interests. However, the Parish Priest is solely responsible for this state of affairs. The Parishioners, the marginalized ones need to be heard. Their efforts to dialog with Parish authority has fallen on deaf ears. We therefore, call upon you to give an audience to these parishioners, being marginalized by Parish authorities and offer them a GOOD LISTENING EAR and understand their woes. We reiterate that these parishioners have been active in the parish for a very long time and now they are being treated as trouble makers. Certainly there is something wrong. It has reliably been learnt that the Parish Priest Fr. Baptist Pais is due for transfer. It is therefore, imperative that the matter is taken up on priority and resolved before his departure. Your Eminence, we do hope that you will understand the seriousness of the issue and act accordingly at the earliest. This is in reference to our telephonic conversation sometime back. I intimated to you, the request from the Executive Committee to come for a meeting organised between you and your Community Animators. Your reply is that you are willing to attend this meeting provided you are given a letter written by your animators. According to you, this letter should be given one/two days in advance to you so that you come prepared for the meeting. By this email, I am herewith conveying your response to the Executive Committee Members. Shall revert to you once we discuss the same. I don’t see the need for a written letter from the animators of the community, as this meeting is being called by the Executive committee. If the matter was vice-versa would Mr Baptist give a letter to the animators requesting them for a meeting with the Executive Committee. The Committee who have called the meeting sends the letter, irrespective of who attends the meeting. This is in reference to our previous conversations on the subject topic. The Executive Committee of Sacred Heart Parish has arranged a meeting of the the Animators of Community no. 4 and your kindself. The meeting shall be held on Sunday the 30th of March at 11 am in the mini-hall. You are requested to attend the same. A copy of the agenda has been attached herewith. As per your Telephonic conversation from your mobile no. 9820530374 which I received on 27/03/2014 time 12:52pm in my mobile no. 9769573020. As per your intimation/ opinion of the Executive Committee, no Agenda of the meeting & Letter copy will be provided to me in advance. And you have insisted that YOU HAVE TO ATTEND THIS MEETING as a PPC member. 2) Copy of the Letters. While the conversation you have stated that IF U COME, DON’T COME. THIS MEETING WILL BE CONDUCTED BY THE EXECUTIVE COMMITTEE WITH YOUR SCC ANIMATORS. And also you mentioned that If you fail to attend this meeting, necessary action will be taken against you. I request to the Executive committee to bring this issue in the coming PPC for the discussion which is scheduled on 03/04/2014. – First individual to prepare the parishioners during the 40 days of lent by decorating the church with sack cloth with appropriate pictures and wordings. – First Individual to publish a Community Directory which helped the community to get connected.. This idea was appreciated by Fr. Cyprian Lewis and was introduced at the Parish level where all the Parishioners had a copy of the ParishDirectory. – Being an Interior Designer – Fr. Cyprian Lewis on many occasions took my advice and I designed the Chapel and the Cemetery and also a few icons in the Church when it was being built.